In the county in which my kids go to school, each child must perform 75 SSL (student service learning) hours before they graduate from high school. Students start earning their hours once they enter middle school, so Sam started this past year and Jack will begin this coming year. Because of this, I am always looking for fun and approved volunteer jobs for my kiddos. Up until now, these jobs have been mostly one-shot events that I've run across. For example, Sam has helped with a school event or we picked up trash for a local organization. However, I've been looking for recurring jobs because that just seems easier than always keeping my eyes open for something my kiddos can help with. Recently, we found a Saturday chess camp at which Sam can volunteer, which is great, but the real coup, the be-all-end-all of SSL volunteer opportunities came when a friend of ours recommended my family for a weekly job, starting this month. The timing was terrible. We trained right during our move and our first week was this week, when my mom was in town and we had 7000 other things to do. It was one more thing that my family could barely handle, but we did it. Do you wanna know what our four-hours-a-week-Wednesday-afternoon volunteer job is? It’s blurry because it was one of seven million photos that my kids took in rapid succession. Yes. It is cat related. Yes. It is a job that was practically tailor made for Team Stimey. 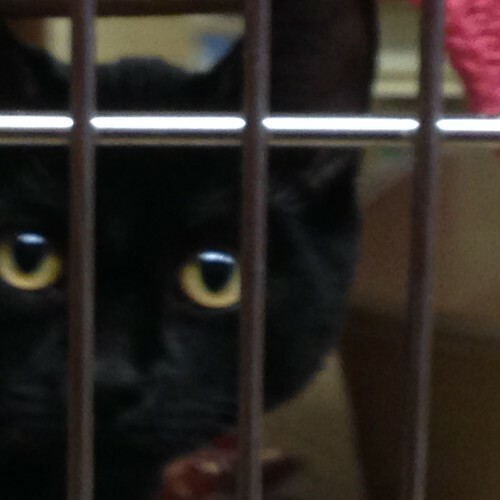 We are working for a local cat rescue organization that put cats up for adoption at a pet store. My kids are in heaven. We clean the cages and keep everything in our little room all ship shape and...wait for it...we play with the cats. 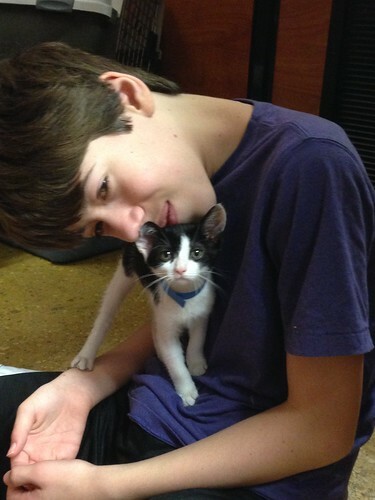 Sam and Jack get to earn their SSL hours by playing with cats. It's the greatest gig ever. Especially considering that I help them clean the cages. Can you tell how hard he’s working? I actually think I got the rawest end of the deal. I'm hoping to take only two of my kids at a time, so as not to overwhelm the cats, so this week I just took Sam and Jack. One of them would help me clean a cage and the other would play with the cat who occupied that cage. Then they would trade for the next cage. Sadly, I never got to rotate out to the cat-playing position to watch them clean a cage together. Fortunately, after we cleaned the cages, I got to snuggle some cats too. But still. Kinda unfair, right? I'm hoping to train them well enough so that eventually I'll just sit and pet cats as I watch my kids scrub litter boxes. I figure we'll get to that point in five, maybe six...years. Still, even though I did a bunch of the work, both Sam and Jack did great. After about an hour, Jack asked for a break, so I let him play iPad for a while. He still earned his hours though because he was simultaneously working hard taking care of the cats. Did I mention that this is the best gig ever? The hazard to this job, however, is that my kids want to adopt every cat in the place. They filled up my phone with photos and videos of the cats that were there this week and I have already gotten my fair share of, "Please mom! I really want to adopt him!" Team Stimey Junior doesn't seem to understand, "But we have a really good cat ecosystem right now and we don't want to upset the balance," so I've had to resort to shouting, "No! NO! I said we're not adopting any more cats! NOOOOOO!" So far no one has cried. Not even me. We all feel pretty happy about the whole deal. But, for the love of god, let's stop throwing these perfect opportunities my way, okay? My calendar is filling up. Have you ever read "So Many Cats" by Beatrice Schenk de Regniers to them? One of our long-time favorites--and yes, the family ends up with a lot of cats. Might make a good cautionary tail (tale) for you guys. I kind of feel like adopting every cat at the pet store too. I could easily end up a crazy cat lady. I might have to go buy that book immediately. I feel like I just reached my Cute Cats on the Internet quota here--now I'm gonna have to get to work! 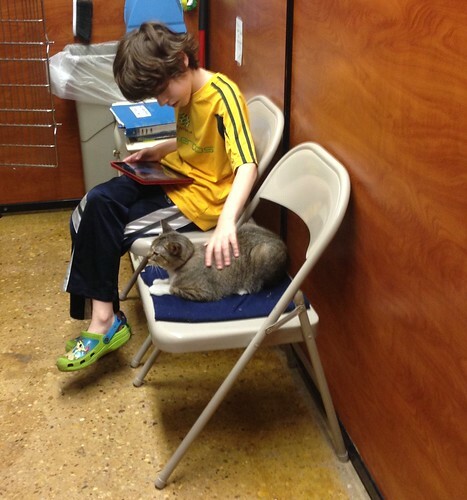 My Q did a camp at the Humane Society near us. And, of course, pet adoption was a running theme throughout the camp. On the last day, the camp director was giving her spiel to the parents and made the comment that she personally feels that everyone needs 7 pets. I looked at Q and said " well, we've already made quota so we don't need anymore." I think the only reason we made it out of their without adopting a pet is that we had just adopted a dog and a kitten the month before. The other cool thing about your volunteer gig is that you will get to meet & play with new cats every time. I posted in my blog last night. Oooh, my boy would like that gig, too! The petting part, not the cleaning part. He is still a bit squeamish. Time. Starting to stalk or being stalked on facebook is so damnably easily done.